Before your company’s warehouse or HQ is able to send you any stock items to replenish your branch’s inventory, your employee from that branch (as end user) will need to submit re-order request through BMO Online Inventory Management System. You can request stock or item from other branch through BMO Online Inventory Management System following steps as shown as below. 1. 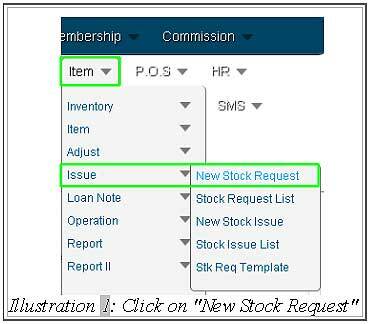 Click on the “New Stock Request” (Item > Issue > New Stock Request) on the navigation menu bar. Please click on image to view clearer. 2. 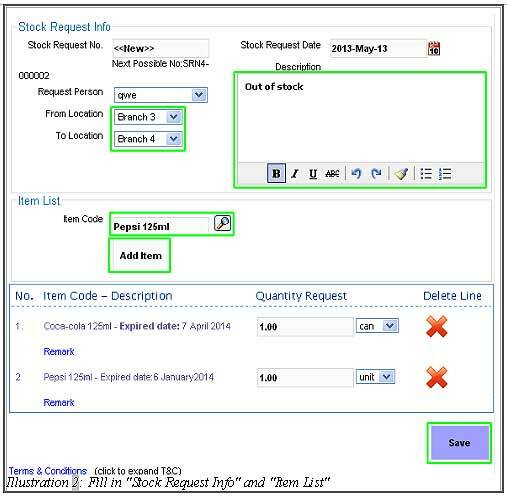 Fill in the “Stock Request Info” and select the item code that you would like to request from other branch at “Item List” section. Then, click on “Save” to save and submit the request. 3. A notification will pop up to notify you that the stock request is successful. Click on “OK” to dismiss the message. Your stock request is now complete. If you need further assistance please contact us during business hours! © 2019 Inventory Management System. All Rights Reserved. Powered by Bizcloud Asia Sdn Bhd | Sitemap.